So this is it! Only one week until the finale of Series 8 of Doctor Who and I have to say that “Dark Water” was a great way to start the two-parter! Be warned, there will be Spoilers if you continue to read! First thing I want to say: HA! My theory about Missy being short for Mistress, which in turn is the female version Master was right! Needed to get that out of the way, because I am never right about anything when it comes to Doctor Who. How sweet that Clara’s gran had another appearance, but it was heartbreaking to see Clara loose it after Danny’s death. Clara betraying the Doctor … I don’t know what to say about it, but I loved the whole thing. Her going so far as to destroy all seven TARDIS keys, the Doctor caring so much about her that he would help her even afterwards and their interaction in general – just perfect. I mean the Doctor saying “Go to hell!” was totally misunderstandable and brilliant. I might even go as far as to say that that was my favourite part of the episode! Okay, we need to talk about 3W! I did not think that the three lifechanging words would be “Don’t cremate me!” … that was sort of odd and I find it scary to think that I would still be linked to my body after dying and fully aware of everything that’s about to happen. That’s just a really creepy thought! But the entire time they showed the symbol of 3W, I thought that I knew it from somewhere. I kept thinking and thinking, but it wasn’t until the sliding doors closed that I finally realised that it was a Cyberman eye. Smart move! But I am afraid I don’t get the whole uploading people’s minds on a Gallifreyan harddrive, while upgrading their human remains to Cybermen … oh wait, I think I just explained it to myself. Poor Dr. Chang got killed so soon … but then again, Andrew Leung was just there to explain the reasoning behing the episode title anyway. There were some really funny moments in the episode, although it had much of a doom and gloom vibe. I mean, WiFi in the afterlife, iPads because of Steve Jobs and Missy saying she’s not a Dalek when the Doctor took the stairs. I don’t know about you, but I laughed at that. I would not want to be greeted by Mr Armitage (Nigel Betts) after I die. I don’t know why exactly, but I don’t find him to be very comforting. Danny, oh Danny … that poor fellow really had to deal with a lot this week. Clara confessing her eternal love for him, his death, meeting the boy he killed during his time as a soldier and then having the possibility to delete himself. (Which would probably just turn him into a Cyberman !) I feel sorry for him and through all of this he still wants to protect Clara, he’s just too good to be true. I could imagine the young boy persuading him to not delete himself next episode, but I am still curious as to see how they’ll get him back to life. 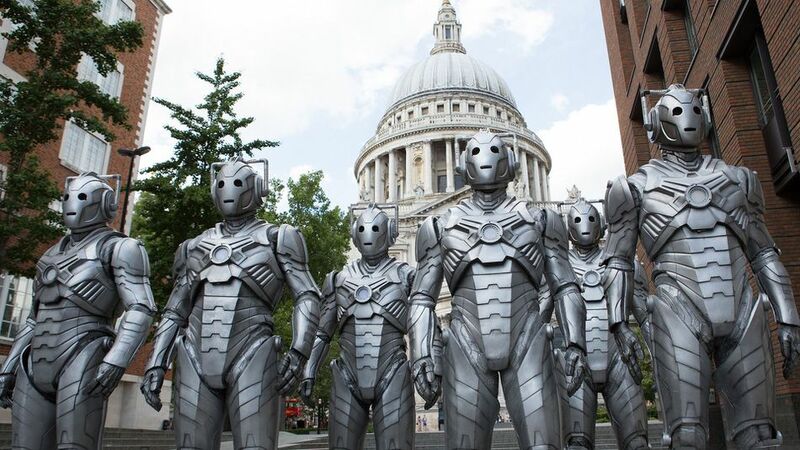 As you know by now, the Cybermen are back and they are made from an army of dead people. Actually not a bad idea, since the dead outnumber the living by a number I don’t even want to think about. We’ll see how they’ll deal with that next week as well. Speaking of next week, there was no promo right after the episode, but they showed some material in the last promo that didn’t appear in “Dark Water“. I am psyched for it no matter what, because the Master is back and that can only be interesting. What were your thoughts on this week’s episode? I quite enjoyed it and it brought back some of my enthusiasm for the show, but maybe that was only the case because I was right about something for once. I had to go back a few times in order to understand what was happening (all that science-y explaining can get difficult at times, and I was wondering how they were going to reconcile this “death” with the Torchwood portrayal of the afterlife, so I was on the lookout for that info. Turns out, not a real afterlife). But yeah, solid first part to a two-parter. And the revelation at the end really surprised me! Of all my guesses for who Missy was, I never expected her to be the Master! Wow! I can’t wait to see how they explain this in the next episode! I was really confused about the whole afterlife thing at first, but since it’s more like “Silence in the Library” where they upload people, but additionally “maintain” their bodies, it sort of made sense. I knew it was the Master! You won’t believe how happy I was about that prediction being correct. Still, I wonder how they’ll explain him or now her being alive. I just hope that they won’t rush the second part. It’ll be 60 minutes long and they should use the time wisely. And if Missy is the person who brought Clara and the Doctor together in the first place, why did she do it? And why has she been biding her time for so long? Right, because Missy said she chose Clara. Was Missy the woman in the shop that gave her the phone number? But wouldn’t Clara recognise her then? I suppose Clara plays some sort of important role in all of this and we’ll have to wait until next Saturday to find out. It wouldn’t surprise me if Clara didn’t remember Missy from the shop at all. The Master used hypnosis a lot in the classic series, and the satellite system he used in Series 3 was basically one big hypnosis device. Wouldn’t surprise me if Missy implanted a suggestion to forget her face after she left the shop. You’re right. I didn’t take that into consideration. But that reminds me of the scene were the Doctor induced the dream state on Clara and she threw the TARDIS keys into the lava. I loved that scene to bits! Yeah, it was pretty awesome. It made me wonder though if the writers are afraid of going into really dark areas. Like we saw this clip and expected Clara to go all bad on us. Turns out the Doctor was in control this whole time. I know it’s supposed to be a kids show, but occasionally we should be terrified by more than just monsters. I like it too when they venture into some darker chapters of the Doctor’s or the companion’s personality, but I was grateful that the Doctor had the upper hand in this situation. I still think it would’ve made for a gripping episode if the Doctor’s companion betrayed him and the world was suddenly against him, and he had to go to hell and back trying to rectify the situation. That’d be interesting. I agree, it would’ve been interesting, but I am just so glad that Moffat didn’t end up creating another impossible paradox. Let’s just hope he doesn’t let the series end with some sort of paradox next week haha one never knows with what solution he comes up for a problem. Here’s another question though: why were all the robots trying to get to the Promised Land? It’s obviously a Cyberman thing, and they’re not Cybermen. Why do they want to get there? I have no idea, but the Promised Land wasn’t just a thing with robots, was it? It was just generally a myth that spread throughout the universe as far as I understood it. But I generally have a problem with the Promised Land now, because it looked very different last time to the serene and peaceful gardens they previously showed. In fact, it looked different every single time. It might be different for every person who ends up in its data core. After all, it’s a computer program, so it probably has a variety of settings for each soul based on their own conceptions of the afterlife. And Missy can get in anytime she wants because she runs the whole thing, she probably has a headset that links her in like Bluetooth. Good point. Still doesn’t explain why the various robots wanted it. Nope, that it certainly doesn’t. The Nethersphere was said to be a derivation of the Matrix, which was a core piece of Time Lord technology in the Classic Series (featured in a bunch of stories between 1977 and 1986) — it was a repository for Time Lord intelligence, where the minds of all Time Lords were uploaded as they died. In 1977’s “The Deadly Assassin” it was portrayed as a virtual reality environment (yes, VR in 1977), manipulated by… the Master. So that’s probably why it looked different to everyone who was “uploaded” there. And that explains how the Master acquired it. I wonder if they’ll find a way to bring Danny back — if he’s truly dead, the whole future with Orson Pink that we’ve already seen, can’t ever play out. The Doctor had a great line about how Clara’s betraying him didn’t change things between them, but, alas, the line’s already gone out of my head!! Thank you for clearing that up, I was really confused by all the technical blabla. I don’t think Danny is dead dead, if that makes sense. But since Missy keeps the bodies “alive” or at least maintained and his conscience is still linked to it, I think there is a chance to bring him back as long as they can find his body. That Doctor-Clara moment was the best, but I also don’t remember his words exactly. I think it was something along the lines of “Do you really think I care that little about you, to not help you just because you betrayed me.” But I don’t know, I’m too lazy to look for the scene on the internet.